While the world watches the revolution in Eastern Europe, a quiet revolution appears to be taking place within the U.S. space com­munity. The Administration has announced that “business as usual” in space is not getting us to our goals for the future. The Vice Presi­dent has announced a broad outreach program to capture new ideas for the direction of our nation’s space activities. The Space Studies In­stitute is continuing to work with the National Space Council, and in addition to the meetings reported in our last newsletter, our ongoing dialogue led to a dinner meeting between SSI founder Dr. Gerard K. O’Neill and the Vice President in February. The dinner, which occurred at the Vice President’s residence, included Richard Dar­man, Head of the Office of the National Space Council Staff, in addition to several others. Discussions included the need for enterprises such as space solar power to provide economic drivers to open the space frontier. 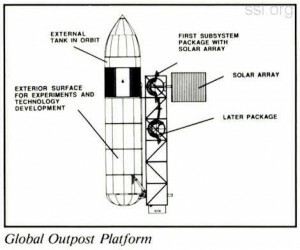 The impor­tance of near-term space resource prospecting missions such as Lunar Prospector was also a topic of discussion. SSI supporters can take pride in knowing that the work that we are do­ing is getting attention at the topmost levels of the United States. NASA has signed agreements with the External Tanks Corporation of Boulder, Colo­rado, and Global Outpost Inc., of Alexandria, Virginia, to provide Shuttle External Tanks in orbit for research and industrial purposes. Space Studies Institute’s studies and testimony before the President’s National Commission on Space provided a crucial foundation for the space policy pronouncement which enabled the grant of these important space resources to occur. Congratulations to our friends at both companies for their successful agreements. I had occasion to visit the McDonnell-Douglas Huntington Beach facility and observe the ten and a half meter dishes which will be used in the construction of the first pilot scale lunar glass plant. I also had the privilege of meeting the McDonnell-Douglas team who, along with Alcoa-Goldsworthy Engineering and SSI, make up the members of our joint venture. I must say that it was extremely impressive to stand at the base of these huge dishes, which are capable of 10,000 Suns concentration. The various pieces of the project are beginning to come together, and we look forward to photos of the initial installation soon. The initial design review for the Lunar Prospector Spacecraft was conducted at the headquarters by OMNI Systems, Inc. in El Segundo, CA, in mid-February. Work is pro­gressing extremely well on Prospector by this very enthusiastic contractor. Dr. Alan Binder, Project Scientist, also conducted a meeting of the principal science investigators in conjunc­tion with the design review. It’s exciting to see the spacecraft begin to move from conceptual studies to real hardware design. Thanks to SSI leadership, the Lunar Prospector story is beginning to ripple through the space community. 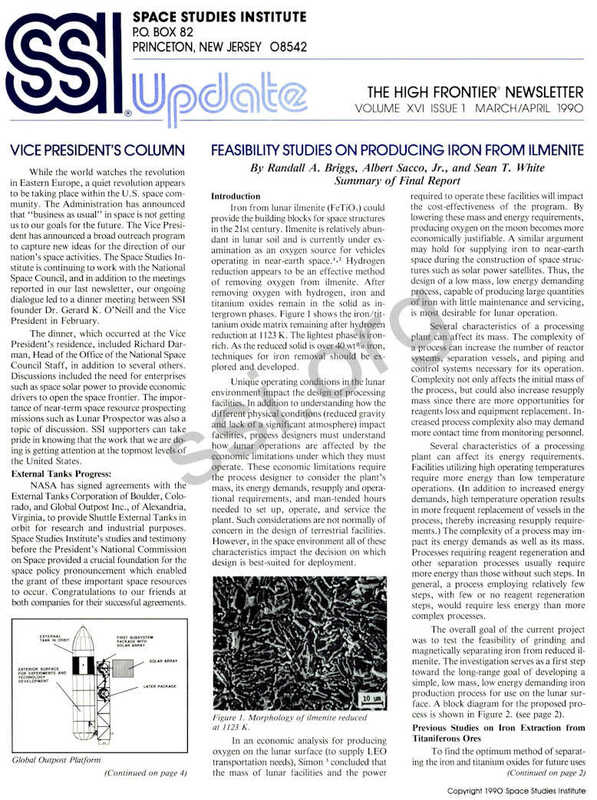 Iron from lunar ilmenite (FeTiO3) could provide the building blocks for space structures in the 21st century. Ilmenite is relatively abundant in lunar soil and is currently under examination as an oxygen source for vehicles operating in near-earth space.1,2 Hydrogen reduction appears to be an effective method of removing oxygen from ilmenite. After removing oxygen with hydrogen, iron and titanium oxides remain in the solid as intergrown phases. Figure 1 shows the iron/tittanium oxide matrix remaining after hydrogen reduction at 1123 K. The lightest phase is iron­rich. As the reduced solid is over 40 wt% iron, techniques for iron removal should be explored and developed. Unique operating conditions in the lunar environment impact the design of processing facilities. In addition to understanding how the different physical conditions (reduced gravity and lack of a significant atmosphere) impact facilities, process designers must understand how lunar operations are affected by the economic limitations under which they must operate. These economic limitations require the process designer to consider the plant’s mass, its energy demands, resupply and operational requirements, and man-tended hours needed to set up, operate, and service the plant. Such considerations are not normally of concern in the design of terrestrial facilities. However, in the space environment all of these characteristics impact the decision on which design is best-suited for deployment. 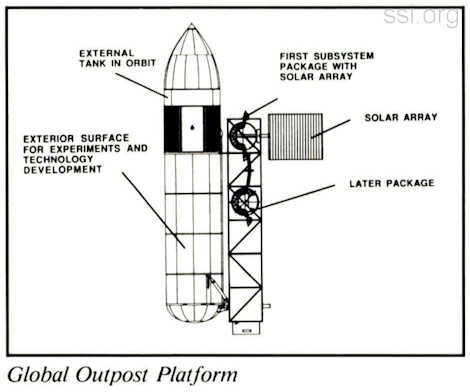 In an economic analysis for producing oxygen on the lunar surface (to supply LEO transportation needs), Simon3 concluded that the mass of lunar facilities and the power required to operate these facilities will impact the cost-effectiveness of the program. By lowering these mass and energy requirements, producing oxygen on the moon becomes more economically justifiable. A similar argument may hold for supplying iron to near-earth space during the construction of space structures such as solar power satellites. Thus, the design of a low mass, low energy demanding process, capable of producing large quantities of iron with little maintenance and servicing, is most desirable for lunar operation. Several characteristics of a processing plant can affect its mass. The complexity of a process can increase the number of reactor systems, separation vessels, and piping and control systems necessary for its operation. Complexity not only affects the initial mass of the process, but could also increase resupply mass since there are more opportunities for reagents loss and equipment replacement. Increased process complexity also may demand more contact time from monitoring personnel. Several characteristics of a processing plant can affect its energy requirements. Facilities utilizing high operating temperatures require more energy than low temperature operations. (In addition to increased energy demands, high temperature operation results in more frequent replacement of vessels in the process, thereby increasing resupply requirements.) The complexity of a process may impact its energy demands as well as its mass. Processes requiring reagent regeneration and other separation processes usually require more energy than those without such steps. In general, a process employing relatively few steps, with few or no reagent regeneration steps, would require less energy than more complex processes. The overall goal of the current project was to test the feasibility of grinding and magnetically separating iron from reduced ilmenite. The investigation serves as a first step toward the long-range goal of developing a simple, low mass, low energy demanding iron production process for use on the lunar sur­face. A block diagram for the proposed process is shown in Figure 2. 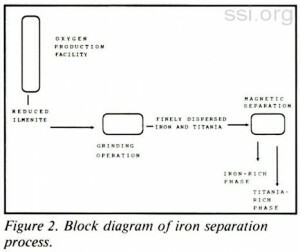 Roberts describes direct reduction followed by chemical treatment as one of “the more successful” processes for separating iron and rutile from ilmenite. After reduction, Roberts notes several methods of separating the iron and rutile fractions including: (1) magnetic separation followed by further upgrading with acids, (2) leaching with dilute acids to remove the iron fraction, (3) rusting out of the solid by suspending in acidified water, (4) leaching with ferric salts followed by electrolysis and (5) leaching with ferric chloride, followed by vacuum crystallization. From his analyses, Roberts concludes oxidation/reduction of ilmenite in the solid state followed by an acid leach is the most attractive means of producing pigment grade rutile. However and importantly, it was noted that the particular environment of the processing unit, the nature of the ilmenite, the cost and availability of power, and the degree of effluent treatment are all factors in the choice of the optimum process. 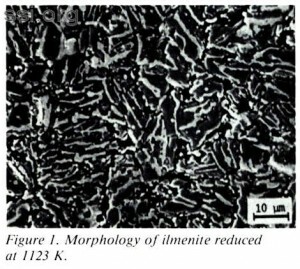 Studies on particular aspects of ilmenite reduction were performed by Ostberg,7 O’Brien and Marshall,9 and others.10,11 Ostberg conducted an early study on the rates of ilmenite reduction and the products and morphologies formed. Carbon monoxide and hydrogen were both used as reductants. The study noted the precipitation of iron in the form of pins, balls, and discs and that the size of these formations increased as the reduction temperature increased. Ostberg tested the effects of adding alkali, boric oxide and phosphorus to iron-titaniferous ores, and noted these substances lead to a coarsening of the iron phase during reduction due to the additive lowering iron’s melting point and increasing its diffusion through the titanium oxide structure. Several other studies9-11 found similar results when carbon was added to the iron­titaniferous phase during reduction. Over the past 20 years, many processes have been put forth to produce metals from lunar soils. A review of these processes was recently conducted by Waldron.12 Most processes produce a range of different materials; however, processes to produce only iron from lunar soil are few. Two have recently been put forth. Lewis13 describes a carbonyl process presently employed in industry that may find application in the lunar environment. Although this process is operated at moderate temperatures (575 K) and requires only carbon monoxide in the extraction process, the intertwined iron and titanium oxide morphology of the solid phase may limit gas/solid contact, thus restricting the formation of iron carbonyl formation. 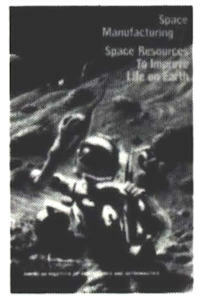 A second method to obtain iron from lunar soils was described by Oder.14 This technique proposed to obtain the small quantity of free iron and troilite (FeS) in lunar soils by magnetically separating these materials directly from the lunar topsoil. However, the simplicity of this process is contrasted by the large quantities of soil that must be processed to produce useful quantities of iron. To reduce iron production costs at the lunar facilities, end products from the oxygen production process could be used as feedstock. Oxygen production facilities are currently envisioned to include two different processing techniques: hydrogen reduction of solid state ilmenite, with and without a preoxidation step. Although the work of O’Brien and co-workers offers encouraging results by reducing iron­titaniferous ores with carbon and carbon monoxide, modifications to their process must be examined as these reducing agents are currently not favored by NASA strategists. An iron production process, in the present analysis, was viewed as an add-on facility at the lunar base. As an add-on facility, it could not dictate the operating conditions of the oxygen production plant to optimize its own feed­stock characteristics. Rather, the iron production plant should be designed to optimize iron separation from the end products of the oxygen plant, regardless of the solid morphology. FeTiO3 + H2 → Fe + Ti02 + H2O. For these feasibility studies, wet magnetic separation was employed to test the effects of various solid treatment techniques on iron extraction from reduced ilmenite. This method of separation proved to be both simple and effective. A series of different treatment techniques were investigated during the study. The purpose of investigating these techniques was to determine favorable procedures for further study. In most cases, while conducting these tests, only one variable was changed for comparative purposes. Fine grains resulted from grinding reduced samples for extended periods of time; however, particles appeared to clump together, as seen in Figure 2(a). To separate these fine particles, ultrasonic agitation was employed. For comparative purposes, one sample, ground for 20 minutes, was split in half. The first half was magnetically separated without agitation, while the second half was allowed to sit in the sonic bath for 15 minutes prior to separation. The unagitated sample yielded an iron-rich product containing 41 wt% iron and a titanium-rich product containing 19 wt% iron. The agitated sample yielded an iron-rich product having 44 wt% iron and a titanium-rich sample with 13 wt% iron. Sonic agitation may have aided the separation process by breaking up iron and titanium oxide particles remaining after grinding. As an increase in iron concentration in the iron-rich product was noted by including sonic agitation, this treatment technique was used in all subsequent iron separation experiments. Iron and titanium dioxide have different coefficients of thermal expansion; ductile iron has a thermal expansion coefficient of approximately 14 x 10-6 K-1 between 300 and 800K,15 while that of rutile over the same temperature is 9 x 10-6 K-1. 16 By quenching (cooling) samples in liquid nitrogen, this difference in coefficients leads to a weakening of iron/titanium oxide phase boundaries. This, in turn, aids in the separation of the two phases during grinding. The concentration of iron in the quenched iron-rich sample was 4% higher than that in the unquenched sample. From these experiments it appears that quenching samples positively affects the subsequent separation of iron and titanium oxide. Additionally noted was the increased iron phase size in the quenched sample. This may also have enhanced separation. 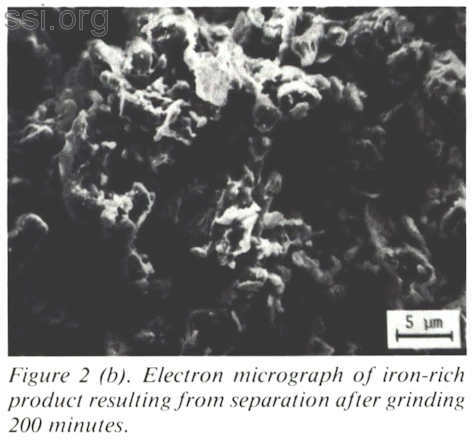 As it positively affected the separation of iron from reduced ilmenite, quenching was employed in samples used in grinding experiments described in the following section. 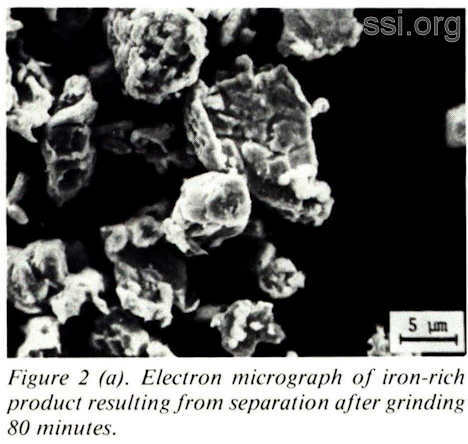 The effects of extended grinding periods on the effectiveness of iron separation was examined. The results indicate that the longer grinding period reduces the grain size of the particles. The significance of smaller grain size is its positive affect on the separation of iron and titanium oxide fractions. 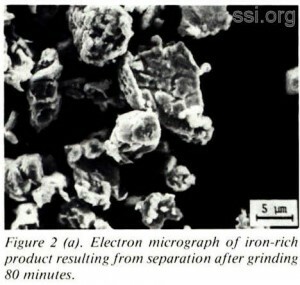 Figure 2(a) illustrates the iron-rich production resulting from separation and after a grinding period of 80 minutes. Comparing Figure 2(a) with Figure 2(b), which also pictures iron-rich production resulting from separation, but after a grinding time of 200 minutes, illustrates the favorable decrease in grain size. Etching is a common metallographic technique used to enhance grain structure for visual examination. Weak acids (such as NITOL, dilute nitric acid solutions) are used to dissolve the grain boundaries, thus outlining the actual grains themselves. The results of the test indicate that etching may not be a productive means of increasing iron separation. During the etching process, iron was dissolved by the acidic solution, thus decreasing the amount available for transfer to the iron-rich product. The numbers support this conclusion. The concentration of iron in the iron-rich sample dropped from 52% to 48% when the solid was etched. The temperature at which reduction takes place only affects the size of the iron formations during the ilmenite reduction process. Tests were run at 1273 K versus the original 1123 K. Results indicate that reduction at the different temperatures does not yield a significant difference in the iron concentration in both the iron-rich and titanium­rich samples. However, the iron phase size found after reduction at 1273 K and compared to that at 1123 K supports the claim that reduction at a higher temperature produces wider iron bands. The benefit of reducing at higher temperatures is the decrease in the amount of reduction time necessary to separate the iron and titanium oxides. 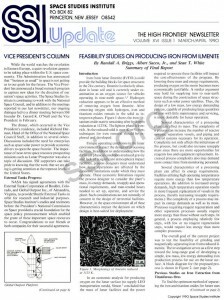 Examination of the morphologies produced during the reduction of ilmenite with carbon have shown that the size of the iron phase increases as the reaction time in­creases.10 Reducing samples for a total of 240 minutes yielded an iron-rich product containing 70 wt% iron and a titanium-rich product with 8 wt% iron. The same reduction time at a temperature of 1273 K produced no significant changes in separation. In both cases, holding sample at temperature appears to positively increase the percentage of iron in the iron-rich product. This enhanced separation may be due to the additional growth of the iron phase. However, it should be noted that the samples held at temperature lost more weight than predicted from equation (1). The longer reduction time allows titanium dioxide to reduce to lower oxides. During a separation experiment, iron was thus in a higher concentration to begin with. This may have contributed to the higher iron concentrations found in the separated products. The effects of reacting ilmenite as a powder wa examined. Powders provide greater solid/gas contact area and thus shorter reaction times. Separation yielded an iron-rich product containing 57 wt% iron and a titanium-rich product with 10 wt% iron. Comparing these results with those obtained from an earlier sample in the same conditions, but of a disc-like geometry, it appears reduction of ilmenite in granular form increases the effectiveness of iron separation. An increase in iron separation from samples reduced in granular form was also noted at 1273 K, as well as 1123 K.
Several factors may have contributed to the higher iron contents in the iron-rich product obtained from samples reduced in granular form. During disc reduction, isolated regions may have been restricted, and reduction incomplete. The more effective separation of iron from samples reduced in the granular form also may have been due to some interaction of hydrogen and the iron phase. The gas/solid contact area was higher when reducing grains and may have led to a coarsening of the iron phase. Temperature did not appear to have an effect on separation of iron from reduced ilmenite in granular form. This indicates ilmenite may be reduced at lower temperatures, thus necessitating less energy, without affecting the separation of iron from the solid phase. The use of preoxidation (reacting ilmenite with oxygen before the reduction process is initiated) to enhance oxygen removal from ilmenite has been suggested as a possible means of lower mass and energy requirements for µroduction facilities on the Moon. In effect, oxidation would begin the separation of iron prior to reduction. Results of the experiment, however, clearly indicate that preoxidation does not appear to enhance the separation of iron from reduced ilmenite. A 7% drop in the concentration of iron in the iron-rich sample was observed, both at 1123K and 1273K. From these preliminary studies, it is believed iron may be extracted from reduced ilmenite via a simple, low energy demanding process. The feedstock to the iron production facilities would be ilmenite grains reduced at moderate to high temperatures. Keeping grains at temperature for extended periods of time appears to enhance the effectiveness of iron separation . Quench-cooling ilmenite grains after remaining at temperature may be included in the processing scheme to increase iron extraction. Including several of these treatment techniques has been shown to produce an iron-rich product containing 70 wt% iron. It is believed that optimization of treatment techniques could allow this process, which employs only physical separation steps, to produce an 80-90 wt% iron-rich material. Can structures be made from fine powders containing 80-90 wt% iron and 10-20 wt% titanium oxide? Such construction material may find some use in the near-earth environment of the 21st century. If higher purity iron is desired, the process outlined above may serve as a means to purify the feedstock prior to entering other iron production processes, such as the carbonyl process.13 By grinding and magnetically concentrating iron prior to chemical refinement, the costs of the refinement process may be lowered. The chemical engineers at Worcester Polytechnic Institute, who carried out the experiments and composed the final report, recommend further research in this area. Because a process that employs only physical separation steps offers a unique opportunity to design a low mass, low energy iron production process for use on the Moon, continued examination of several of the more promising treatment techniques is warranted. 1. Briggs, R.A. and Sacco, A., “Investigation of Ilmenite Reduction with Hydrogen and Ilmenite Oxidation with Oxygen,” 3rd semiannual report submitted to the Advanced Projects Office and In-Situ Resource Utilization Office at NASA ­ Johnson Space Center, February 1989. 2. Briggs, R.A. and Sacco, A., “Oxidation and Reduction of Ilmenite: Application to Oxygen Production on the Moon,” Proceedings from the Second Conference on Lunar Bases, Houston, TX, (April 1988). 3. Simon, M.C., “A Parametric Analysis of Lunar Oxygen Production, ” Lunar Bases and Space Activities of the 21st Century, W. Mendell, ed., Lunar and Planetary Institute, Houston, (l985). 4. Traill, R.J. and McClelland, W.N., “Metallization of the Oxide of Iron in Ilmenite,” Can. Chem. and Met., 13, 265 (1929). 5. Henn, T.J. and Barclay, J.A., “A Review of Proposed Processes for Making Rutile Substitutes,” Dept. of the Interior, U.S. Bureau of Mines Rpt. #8450 (1970) 27 pp. 6. Roberts, J., “Ilmenite Upgrading,” Min. Mag., 125, 543 (1971). 7. 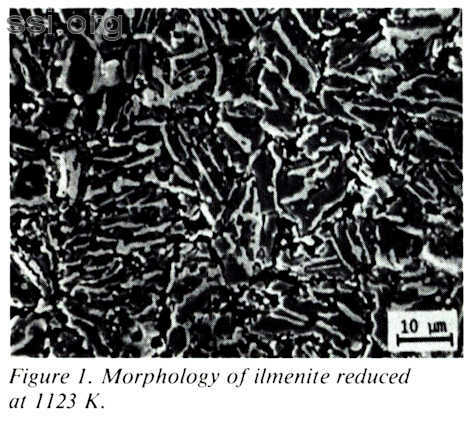 Ostberg, G., “Solid State Reduction of Ilmenite,” Jemkont. Ann., 144, 46 (1960). 8. Magri, R.J. and Sieber, C.W., “Method of Beneficiating Ferro-Titaniferous Ores,” U.S. Patent 2,721,793, October 25, 1955, 7 pp. 9. O’Brien, D.J. and Marshall, T., “Spheroidization in Metallized Iron-Titanium Ores,” N. Zealand J. Sci., 8, 3 (1965). 10. O’Brien, D.J. and Gain, D., “Effects of Temperature and Time on the Spheroidization of Metallized Ilmenite,” N. Zealand J. Sci., 10, 736 (1967). 11. O’Brien, D.J. and Marshall, T., “Conversion of Ilmenite to High-Titania Products and Spheroidal Iron,” N. Zealand J. Sci., 11, 159(1968). 12. Waldron, R.D., “Lunar Manufacturing: A Survey of Products and Processes,” Acta Astronautica, 17, 691 (1988). 13. Lewis, J., Presentation at the In-situ Resource Utilization Workshop. Conference Chairman: D.S. McKay, In-situ Resource Utilization Office, NASA-JSC, Orlando, (June 1989). 14. Oder, R.R., Taylor, L.A. and Keller, R., “Magnetic Characterization of Lunar Soils,” Abstract to the 20th Lunar and Planetary Science Conference, 804 (1989). 15. Perry’s Chemical Engineers’ Handbook, Sixth Edition, McGraw-Hill (1984). 16. Taylor, D., “Thermal Expansion Data: II-Binary Oxides with the Fluorite and Rutile structures, M02, and the Anti­fluorite Structure, M2O,” Trans. Bri. Cer. Soc., 83, 32 (1984). SPACE NEWS, a weekly newspaper devoted exclusively to the politics and business of space, is offering free 13 week trial subscriptions to colleagues of the Space Studies Institute. SPACE NEWS, the first news publication to cover space without the aircraft business, offers up-to-date, reliable information on space policies, budgets, NASA, commercial and military space, the satellite and international arenas, and developments that affect the public and political support for space activities. Please send inquiries to: David Smith, Marketing Director, SPACE NEWS, 6883 Commercial Drive, Springfield, VA, USA 22159. SSI Press has republished The High Frontier by Dr. Gerard K. O’Neill. The new edition contains a Preface by Astronaut Kathleen Sullivan, an updated Introduction and final chapter by Dr. O’Neill, new cover art by Pat Rawlings and cover design by Peter Thorpe. 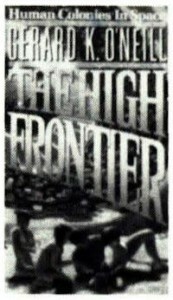 The High Frontier was originally published in 1976 and won the Phi Beta Kappa Science Book of the Year Award in 1977. It is widely recognized as the first book to describe space colonies, space manufacturing, and the opening of the High Frontier of space. 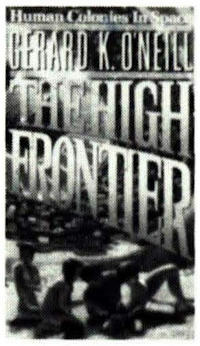 The High Frontier is published by SSI Press, 327 pp., trade paperback, ISBN 0-9622379­0-6, available from SSI Press. At a time when global concern for the Earth’s limited resources is growing, Space Manufacturing 7 reflects the increasing support for using space power for terrestrial use. U.S. exploration of three methods of using lunar resources for energy are considered, along with satellite power activities internationally. Additional discussions are focused under: External Tanks and Space Habitats, Nonterrestrial Resources, Space Manufacturing and Space Power, International and Economic Considerations, Space Biospheres, Space Transportation, Lunar Bases and Biomedical Considerations. Space Manufacturing 7, Proceedings of the 1989 SSI/Princeton Conference on Space Manufacturing, published by AIAA, 378 pp., hardcover, ISBN 0-930403-63-2, available from AIAA, Washington, DC, $39.95 for SSI or AIAA members, shipping $4.50.